What Is PRK Eye Surgery? Astigmatism is an optical defect in which vision is blurred due to the inability of the optics of the eye to focus a point object into a sharp focused image on the retina. This may be due to an irregular or toric curvature of the cornea or lens. 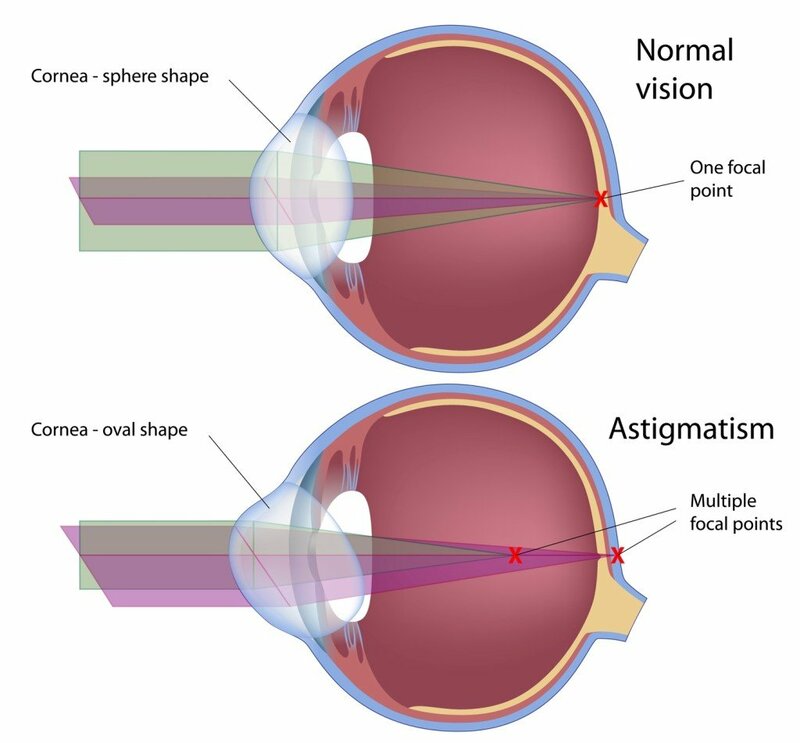 The two types of astigmatism are regular and irregular. Irregular astigmatism is often caused by a corneal scar or scattering in the crystalline lens, and cannot be corrected by standard spectacle lenses, but can be corrected by contact lenses. The more common regular astigmatism arising from either the cornea or crystalline lens can be corrected by eyeglasses or toric lenses. A ‘toric’ surface resembles a section of the surface of a Rugby ball or a doughnut where there are two regular radii, one smaller than the other one. This optical shape gives rise to astigmatism in the eye. Astigmatism optics solutions vary based on the severity of the curvature. Astigmatism is a natural and commonly occurring cause of blurred or distorted vision. The exact cause in not known. Your eye doctor can diagnose astigmatism with a thorough eye exam. Astigmatism may occur with other vision problems such as nearsightedness and farsightedness. Because astigmatism may increase slowly, you should visit your eye doctor whenever you notice changes in your vision. Almost all degrees of astigmatism can be corrected with properly prescribed eyeglasses or contact lenses. For a person with only a slight degree of astigmatism, corrective lenses may not be needed at all, as long as other conditions, such as nearsightedness or farsightedness, are not present. If the astigmatism is moderate to high, however, astigmatism optics corrective lenses are probably needed. Corrective lenses (eyeglasses or contact lenses). For astigmatism optics, special soft contact lenses called toric lenses are prescribed. Soft toric lenses have greater light bending power in one direction than the other. Another option, particularly for higher amounts of astigmatism, is a gas permeable rigid contact lens. After performing various tests, your eye doctor will determine the ideal prescription for your astigmatism. Refractive surgery. Another method for correcting astigmatism optics is by changing the shape of the cornea through refractive or laser eye surgery. 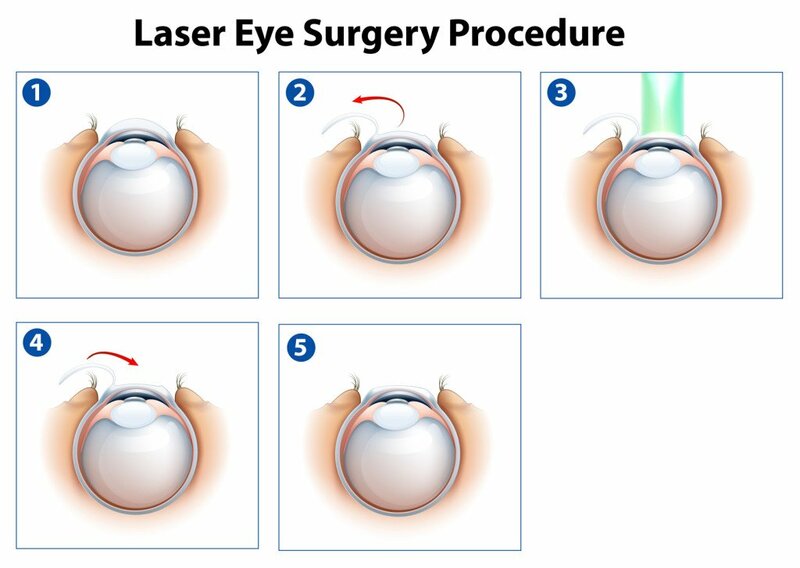 While there is more than one type of refractive surgery, specific treatments are recommended on an individual basis. Refractive surgeries require healthy eyes that are free from retinal problems, corneal scars, and any eye disease. As technology progresses, it is becoming more and more important that you explore all options and possibilities before deciding which refractive surgery and treatment is right for you. Call Concierge Eye Doctor, Dr. Barry Belgorod, to set up a Consultation to determine which astigmatism treatment is right for you. Call : 212-753-2020 or visit our contact page.